- A constructed deck built of 50 cards. - There are 18 different cards. - The deck consist of 1 RRR and 2 R cards. 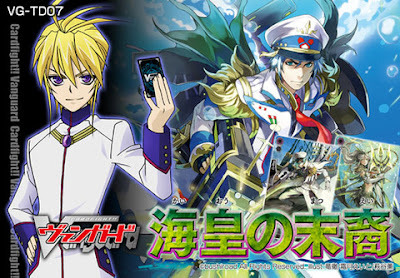 - The theme of this deck are Aqua Force units that will be used by Souryuu Leon. - This deck is used by an important rival, Souryuu Leon, seen during the Asia Circuit Arc anime series, and he is using a new clan, Aqua Force (アクアフォース), which will be appearing in BT08. - There are 8 cards exclusive to the Trial Deck with 2 that will be reprinted in BT08. Auto [V]: When this unit attacks, and if it is the third battle of that turn or more, this unit gets [Power] +3000 until the end of that battle. Auto [R]: When this unit attacks, if you have an 《Aqua Force》 vanguard, and if it is the third battle of that turn or more, this unit gets [Power] +1000 until the end of that battle. Auto [V/R]: When this unit's attack hits a vanguard, if you have an 《Aqua Force》 vanguard, and if it is the fourth battle of that turn or more, draw a card. Auto [V/R]: When this unit attacks, if you have an 《Aqua Force》 vanguard, and if it is the third battle of that turn or more, this unit gets [Power] +3000 until the end of that battle. Auto: When this unit [Intercepts], if you have an 《Aqua Force》 vanguard, this unit's [Shield] gets +5000 until the end of the battle. Auto: When this unit is placed on [R], choose another of your 《Aqua Force》, and it gets [Power] +2000 until end of the turn. Auto [R]: [Choose a card from your hand, and discard it] When an attack hits during the battle this unit has [Boosted], you may pay the cost. If you do, draw a card. Auto [R]: When this unit [Boosts] an 《Aqua Force》 vanguard, and if it is the third battle of that turn or more, the [Boosted] unit gets [Power] +4000 until the end of that battle.